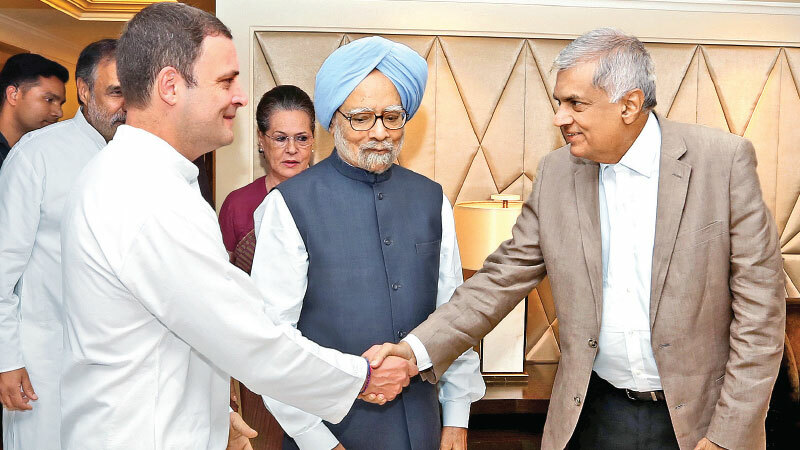 Prime Minister Ranil Wickremesinghe who is currently on a three day visit to India, met the President of the Indian National Congress Rahul Gandhi at the Taj Hotel in New Delhi yesterday. The Prime Minister had briefed Gandhi on the Sri Lankan Government’s programme to promote ‘Freedom of Navigation in the Indian Ocean’. Representing the Congress Party were former Indian Prime Minister Dr. Manmohan Singh, Sonia Gandhi, Ananda Sharma and other representatives. They also discussed the regional economic situation and current political developments. The future shape of Asia and the power shifts as well as the need to curb extremism in the region were among the subjects discussed. The Congress leaders had also showed interest in the current social welfare programmes in Sri Lanka. Prime Minister Wickremesinghe invited Rahul Gandhi to visit Sri Lanka and thereafter the two exchanged momentos to mark the occassion. Petroleum Resources Development Minister Arjuna Ranatunga, Youth Affairs, Project Management and Southern Province Development Minister Sagala Ratnayaka, International Trade and Development Strategies Malik Samarawickrema, Secretary to the Prime Minister Saman Ekanayake, Sri Lankan High Commissioner to India Chitrangani Wagishwara and Additional Secretary to the Prime Minister Saman Athaudahetti accompanied the Prime Minister to the meeting. The Prime Minister is scheduled to have bilateral discussions with Indian Prime Minister Narendra Modi today (20).